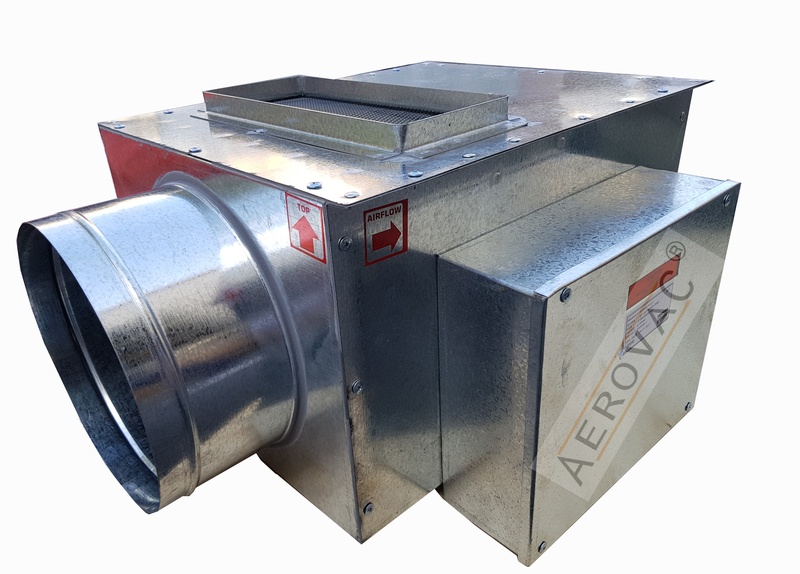 The Model AV-100 Series is designed to maintain optimum occupant comfort by varying the amount of cold air from the constant volume air handler and bypassing the excess cooling air back to the air handler. The AV-100 Series responds to the thermostat demand for cooling by varying the position of the unit damper, which in turn controls the amount of air entering a zone. During reduced loads, the damper position changes to deflect supply air into the ceiling plenum or return air duct. In this way, the air handler operates at constant volume, while individual zones benefit from increased control of comfort levels. Savings result from the elimination of variable speed drives for the air handling system fan(s). At reduced zone loads, cool primary air is returned to the air handler via the plenum or return air duct without experiencing zone heat gains. The lower return air temperature allows the air handler to operate more efficiently. The AV-100 Series unit comes standard in several different configurations. AV-100 Series VAV uses a single actuator driven primary air damper working in concert with a bypass port balancing damper. As the primary air damper closes, the bypass port damper opens and vice versa so that a required volume of air is delivered by the air terminal to the conditioned zone, but in varying amounts of air volumes are delivered to the room as demanded by the room thermostat. A variable Air Volume, the by-pass system consists of VAV units connected to the supply air duct of a constant air volume source. A constant volume of conditioned air is supplied to each VAV unit. The primary damper modulates in response to a zone thermostat demand, to vary the amount of conditions air delivered to the occupied zone. Damper operation On / Off or Modulating will range from full shut-off to fully open by supplying variable air volume, or to a minimum air volume to the conditioned zone. As the primary damper modulates in response to room thermostat, demand and once it is satisfied to reduce the air volume to the occupied zone, the excess air is diverted through the by-pass secondary damper into the ceiling plenum for free or ducted return. Internal Acoustic Insulation of 12mm thick acoustic foam liner with 28 kg/m3 or 25mm thick, 24kg/m3 acoustic liners made of fiberglass with Black tissue-facing. The standard actuator controls will be supply in AV 100 series are on/off type. Modulating Type of Actuators, with 24Vac operating voltage, will be installed with Digital Thermostat will be supplied upon client's request and optional. DDC, BMS & Bacnet compactable controls will be supplied upon the client's request and optional.